The letter published online by the Campaign Against Arms Trade, states that an event was held at the museum by Italian arms firm Leonardo (which is the world’s ninth largest according to the Stockholm International Peace Research Institute) in conjunction with the Farnborough Air Show. It says that Hope to Nope, which explores a decade of protest from from the global financial crash and the Arab Spring, to ISIS, Brexit and Trump through graphic design, is making the museum appear progressive and cutting-edge, ‘while its management and trustees are happy to take blood money from arms dealers’. 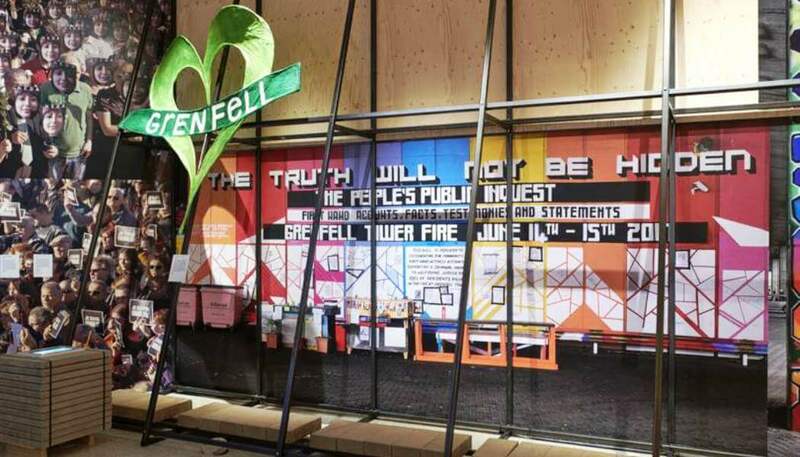 The criticism was aimed at the management and trustees of the Design Museum and not the curators who the letter says ‘have created a fantastic showcase of radical art’. The letter ends by demanding that the artists’ work will be taken down by 1 August at the latest, as it is now being displayed without consent. It says that as a charity, 98% of the museum’s running costs come from admissions, retail, fundraising and event hire, such as the one hosted that night. It said that was a private event of which there was no endorsement by the museum. An online petition saying the Design Museum should not be supporting the arms trade has received 2,440 signatures.